Somdev Devvarman and Sania Mirza notched up a rare double for India at the US Open by advancing to the second round of the season's last Grand Slam with contrasting opening wins at the Flushing Meadows hardcourts in New York. While Sania opened with a roller-coaster 6-2, 3-6, 6-3 win over Olga Govortsova of Belarus in women's singles, qualifier Somdev got the better of Portugal's Frederico Gil 6-3, 6-4, 6-3 in the men's competition. "I'm really happy we have two players in the second round of a Grand Slam. "Things are looking up," Sania said after her win. 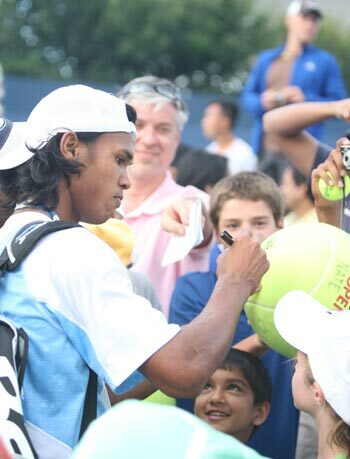 Somdev, meanwhile, said the scoreline might show a straight-set win but he had to toil hard on the court. "I really dug in there, didn't get tight. I competed well. That's what gets you through those tough ones - the way you compete," he said. 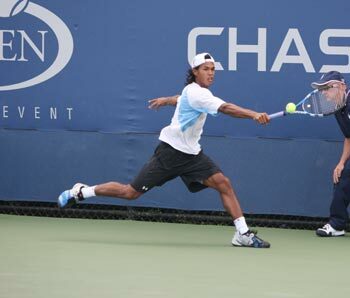 Somdev played a solid service game in the contest which lasted more than two hours, breaking his rival seven times. "I don't want to jinx myself but I feel good about where I am. I've had a couple of quality wins. "It gives me a lot of confidence and belief that I can come out and compete with anyone. My game is up there with the rest," he said. Sania, on the other hand, had to fight it out harder but was helped by her opponent's weak serve and unforced errors. The Indian ace broke her rival seven times and served marginally better to come through in the match that lasted close to two hours. "The toughest thing is to get that first win under your belt. "Under the circumstances I'm just happy I can come through that match and get off to a good start. To me it has already been successful," she said. The 24-year-old Somdev also promised to touch new heights after going through challenging times since entering the professional circuit. "I had some matches coming into today and I think that helped. I put in some really good training. Fitness is the strength of my game. "It has been an emotional roller coaster for me," he said. "Hopefully I will keep that going," he added. On her nagging wrist problem, Sania said the injury that threatened her career at one point is finally healing. "I'm happy with the way I'm playing. Physically I've never been fitter in terms of the way I'm moving on the court and playing in matches. "I came up with the big shot that I needed to have. I have that big weapon when I need to use it," the 24-year-old said. The recently-engaged star said she was ready for a grand comeback after spending a lot of time on the sidelines due to injuries. "I'm at that stage where I'm ready to go up again and go into the new year with confidence. The major wrist problem is finally gone. It's about trying to stay as injury-free as possible," she said. "You don't realise how much you miss playing tennis until you think you might not be able to play again. That made me really grow as a person. I appreciate it more being on a tennis court now," she added. The 162nd-ranked Somdev will take on German 23rd seed Philipp Kohlschreiber, who defeated Italy's Andreas Seppi 6-0, 6-4 , 6-4 in the second round. The 24-year-old promised to carry on the good work after going through challenging times since entering the professional circuit.